One of my all-time favorite Sports Illustrated photos. I've been debating with myself all week if I should write this, but after reading some great pieces from Wojo and John U. Bacon, I think I have the inspiration I need. "We don't need Notre Dame. They need us more than we need them." That quote might have been uttered in the heat of battle, or during a moment when Bo let his guard down. But he said it. And I think that quote still resonates today. Michigan already has it's fair share of great rivals. Ohio State, Michigan State and Minnesota are rivalries that any other college program would be thrilled to have. They go back generations. Michigan and Minnesota play for one of the oldest trophies in all of American sport when they get together. Ohio State and Michigan State are rivalries that are renewed every year to tremendous fanfare. Michigan head coach Brady Hoke put countdown clocks in the locker room for those two games. But he did not put up a clock that counts down to September 10th at 8PM. Why not? 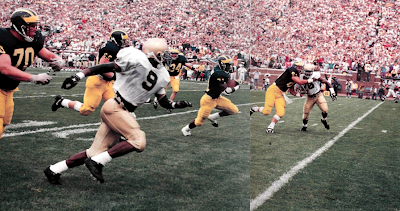 Because Michigan versus Notre Dame, while sounds like a great matchup on paper, just doesn't have the same meaning to it that it used to have. Notre Dame versus (insert team here) doesn't have the same meaning to it that it used to have. You can see the common thread here. Was it the NBC deal and BCS deal that set Notre Dame apart...almost too much so? Was it the stubbornness to remain independent? To keep themselves above the unwashed masses of the Big Ten and other pedestrian conferences? Dare I say, a religious devotion to the past? I can only imagine Bo's quote didn't go over too well in South Bend. But I can also imagine that deep down, the Notre Dame brass knew Bo was right. And they've been trying so hard to prove him wrong. Now that the concept of super-conferences are starting to gain traction in college football, the walls around the Irish football program must start to feel like they're closing in a little. Notre Dame's hand will eventually be forced, one way or another. The choice to affiliate with a conference goes against everything that Notre Dame football has always been about. But Notre Dame football used to be about winning and playing like a champion. No Notre Dame player has been able to play like a champion since 1988 when Lou Holtz guided the Irish to a perfect season and a National Championship. Since then, it's been a ebb and flow of frustration and moderate success. All of the coaching changes seem to only expound the larger issue. Some great football minds have passed through South Bend only to be shown the door a few years later. Notre Dame is stuck in a cycle of mediocrity. Is Brian Kelly the answer? Maybe. He has proven that he is a very good football coach. But is the prescription for Notre Dame's struggles a new coach? Or is it something more fundamental? I didn't plan on this piece to turn into a list of reasons why Notre Dame isn't as dominant as they used to be, but how can anyone write about Notre Dame and not eventually get to it? Notre Dame used to represent great tradition and a culture of championships...all the things that were great about one of college football's most storied programs. I can remember, vividly, watching Notre Dame games against Michigan, USC, Boston College, Florida State back in the day. Notre Dame was a giant. They were the titans of college football. The best of the best of high school recruits lined up to play at Notre Dame. Now they line up at places like Oregon because of Phil Knight and his awkwardly hip uniforms that fly in the face of old school tradition. I don't think the Michigan-Notre Dame rivalry has suffered because of both team's recent struggles. Those deeply rooted traditions are still a huge draw for this rivalry. But Bo's quote has always had an effect on me when I watch this game. I can't really explain it, but it's something that's definitely there. I'll be thinking about Bo a lot tomorrow night. How would be feel about playing Notre Dame under the lights? Or permanent lights at the Big House? Or "legacy" jerseys? Bo used to say that he didn't like television dictating how and when college football games are played. Line 'em up and play at 1 o'clock and if they want to televise it, that's their business...he would say. Oh how times, and college football, have changed. Man...I'm getting old.